Israel Calls Challenge to Blockade of Gaza a "provocative joke"
The "Irene," a 30-foot catamaran sail boat with eight Jewish activists from Europe, Israel, and the US, sponsored by the UK-based Jews for Justice for Palestinians and the German Jewish Voice organization, is approaching the Israeli self-declared "security zone" off Gaza to challenge the Israeli blockade of Gaza. A German Jewish Voice organizer Kate Katzenstein-Leiterer said in June, "We want Israel to behave in a way that it can be recognized as a democratic state. Now it is recognized as a criminal state. That is not what we want." As the "Irene" sails toward Gaza, an Israeli foreign ministry spokesman, Andy David, described the "Irene's" mission as "a provocative joke that isn't funny." As a passenger on the flotilla of boats that attempted to break the Israeli and international blockade of Gaza in late May, 2010, I am remembering four months ago, as our ships got closer and closer to Gaza. We were at least 100 miles offshore when Israeli radio operators began calling the captain of each of the ships, telling him to turn back and not to try to breach the quarantine on Gaza. Each captain eloquently replied that his ship was an unarmed ship, with civilians on board, with cargos that had been inspected by national customs agents at the port of departure to ensure that no weapons were on board and that we were taking construction materials and medical equipment to Palestinians in Gaza who were suffering under the collective punishment of the blockade -- and that he was continuing on to Gaza. At 4am, we saw commando boats speeding toward us. Tomorrow morning the "Irene" will probably see the same -- young commandos who will attempt to board in international waters their unarmed, civilian sailboat carrying humanitarian cargo, carrying children's toys and musical instruments, children's toys, musical instruments, textbooks, fishing nets and prosthetic limbs. This time the commandos will face a ship filled entirely with members of their own Jewish faith. They will face one of their own military. Yonatan Shapira is a former Israeli military pilot and represents Combatants for Peace. His brother Itamar Shapira is also onboard. The commandos will also face Rami Elhanan, an Israeli citizen whose daughter Smadar died in a 1997 suicide bombing at a Jerusalem shopping center and who is a founding member of the Bereaved Families Circle of Israelis and Palestinians for those who have lost loved ones to the conflict. They will face Reuven Moskovitz, an 82-year-old Holocaust survivor, who is a founding member of the Jewish-Arab village Neve Shalom (Oasis of Peace). In a statement on the Jewish Boat to Gaza website, Moskovitz said, "We are two peoples, but we have one future." They will face Lillian Rosengarten, a refugee from Nazi Germany, and now an American peace activist and psychotherapist. 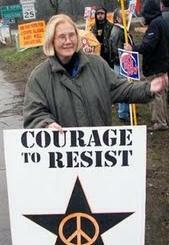 They will face Dr. Edith Lutz, is a peace activist and a nurse from Germany who was on the first boat to Gaza in 2008. On board to provide a first-hand account of the actions of the commandos will be Eli Osherov, a reporter from Channel 10 in Israel and Vish Vishvanath, a freelance photographer and reporter. Glyn Secker, a British citizen, the captain of the "Irene," and a member of Jews for Justice for Palestinians Executive Committee said, "In the tradition of the civil rights movement...we assert our right to continue to Gaza under international law. We have a particular point to make, as the voice of Jews who have an alternative opinion to that of the Israeli establishment." Mr. David and the rest of the Israeli government no doubt knows that other groups around the world from Spain to Malaysia, from Sweden to Doha, from Canada to Turkey are fundraising for ships to be a part of the next flotilla.